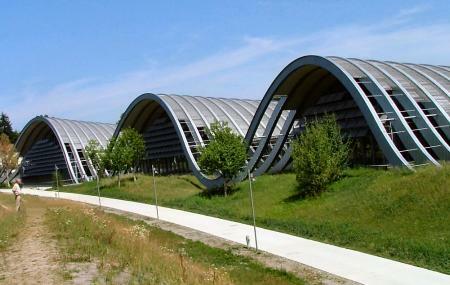 Paul Klee, one of the best artists Switzerland proudly calls its own, has a museum set up in his honour. One of the best museums you’ll come across in Switzerland, some 4000 works of the artist are up for public display. Housed in a building that looks like a hill, the museum is divided into said hills. The middle hill is where Klee’s main works of art are; they keep rotating every year and at any given point there are at least 4000 paintings to feast your eyes on. You could also learn the break-down of some of Klee’s famous works via the computer displays in the interactive area. Embark on a tour with the help of an audio guide of his work. How popular is The Paul Klee Collection? People normally club together Rose Garden and Cathedral At Munsterplatz while planning their visit to The Paul Klee Collection. Had a quick visit recently - the building itself is impressive enough and there is a lot to like in it. From the left side inside, you will find a caffee like restaurant which is a little bit expensive compared to most restaurants in Bern, but I guess that is expected from an attractive place. We also had a short 1 hour tour over a nicely built drawings musem that was having a lot of pictures and drawings from fancy and famous people like Picaso. Even though I am not the most attracted to those stuff kind of person, I had really enjoyed the tour, we also had an audio guide lady which in this whole hour she has been telling us everything about the drawings and their owners (in English) - Recommended, definitely. The works of Paul Klee should be much better arranged. Now there is no sense at all and the museum attendants are just saying "you can view them in any order you want". It would be nice to get an idea of the timeline, his progress as an artist etc. but with the current arrangement it's quite difficult. Very modern building. Had problems getting there with our Garmin. Entrance fee is not cheap. If you like modern art you will surely appreciate it. I am more of a romantic, rococo, Gothic, give me lots of details kind of person so I was done pretty fast. I enjoyed the films though! One very large room, with the artist's biography on the wall all the way around the outside of the room. The central part of the space contained multiple small galleries, each of which was arranged chronologically and thematically. That is, his explorations of pure abstract were in one small gallery; his cubist works in another, and so forth. Superb museum! Building itself is lovely. It's a very short walk from the tram stop. Wheelchair accessible.